Our Semi-Permanent Makeup Treatment Services namely includes: Eyebrow, Eyeliner, Lips, Hairline Embroidery and Eyelash Extensions and others. Our Skincare Services namely includes: Korean BB Watershine Foundation, K-Luxury Gold Therapy, K-Oxygen Skin Indulgence, K-Glow PDT LED Light Therapy, Allatin Peel and others. Brows are an important feature because they frame your face and can alter your appearance. K-Beauty favours a thick and straight brow, because it makes you look younger. Drawing perfect brows takes skills and time. If you have neither, why not leave it to the pros by opting for K-Natural Eyebrow Embroidery services? KO BROWS Eyebrow Embroidery services adopts the hair strokes and makeup techniques to create natural style for your eyebrows. The advantages of 3D techniques fill in eyebrows that are empty or sparsely, three-dimensionally expressed just like real eyebrows as it is drawn strand by strand as lines along the shape of eyebrows. To further enhance more natural and defined brows, 6D techniques creates more natural lighter strokes. We have various types of eyebrow embroidery services like Natural Embo, Gradation Suji, Makeup Machine and 6D combo for various styles! 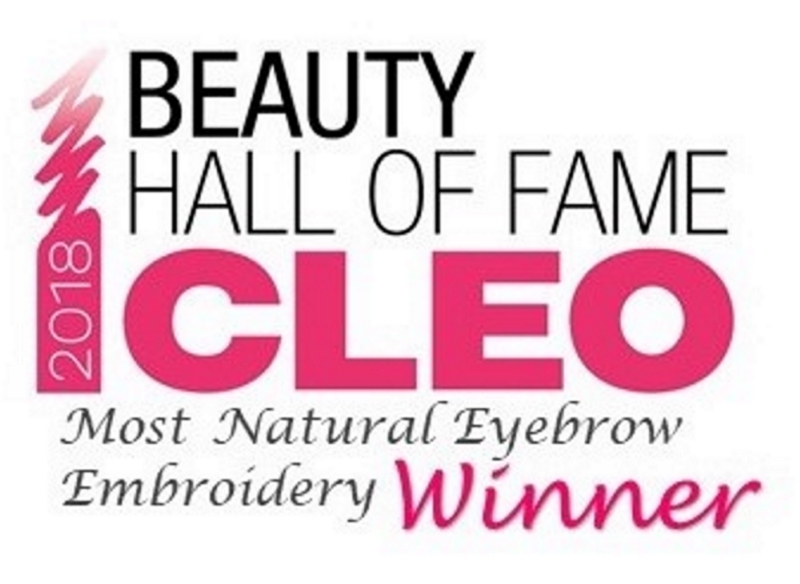 KO BROWS K-Natural Eyebrow Embroidery is the Winner of CLEO Beauty Hall of Fame 2018 – Most Natural Eyebrow Embroidery. Feeling vexed over “blotched” eyebrows from previous eyebrow embroidery? You can visit us for a consultation on how we can help you. Read up on our reviews by our satisfied customers. Come and experience KO BROWS services today! Long and full lashes will always be in style. But there’s always only so much mascara can do for thin or sparse lashes, and falsies can be tricky to put on when you’re in a rush. Try getting eyelash extensions, which saves you the hassle of doing anything else to your lashes! KO BROWS uses soft Velvet lashes and attach them to your own lashes individually, to create beautiful, light and natural looking lashes. Choice of lashes ranges from different length, thickness and curl type to suit your needs. We offers customization of styles to suit each customer’s preference as well. The touch up session is to fix the loose strand, it is encouraged within 2 weeks from the first full session. With the touch up, the lash extension can last up to 1 month. 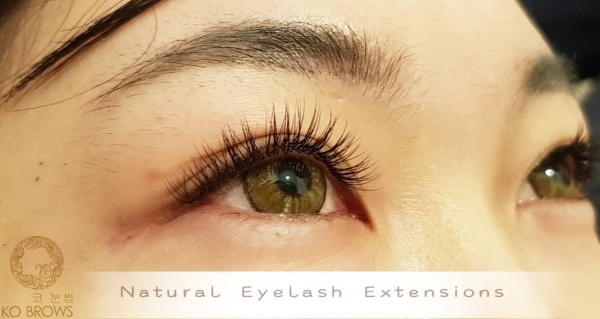 Our experienced specialists will look at the length, thickness and curl type of the extensions to customize the most natural-looking set of eyelash extensions for you. You also get a nice, pampering collagen eye treatment as part of the service. Our Korean customers would prefer Single eyelash extensions while local customers would prefer a more “dramatic” effect. Whichever effect you are looking for, our experienced Specialists would be able to help you achieve the desired effect! We provide eyelash extensions touch up, lash removal and eyelash perm services. Try our K-Natural Fantasy Eyelash Extensions services today! Comes with high quality lashes, Lashes Spa, Collagen Eye Treatment and Return lash removal! Imported ingredients. Korean Consultant and Specialists. We get it – drawing eyeliner everyday can be a chore, especially when life doesn’t cooperate and one wing ends up higher than the other. 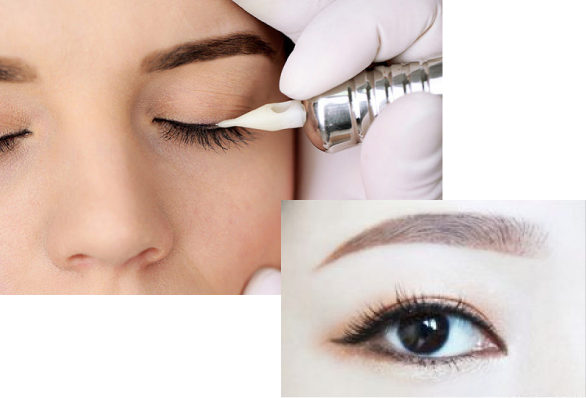 The good news is, you can opt for the semi permanent treatment of K-Natural Eyeliner Embroidery services, which subtly defines your peepers to give the illusion of bigger eyes. The finish is natural, so you don’t need to worry about it looking too dramatic on your no-makeup days. If you need your eyeliner to stay on all day, try this smudge-proof and waterproof solution to all your eyeliner woes. KO BROWS uses the technique that gives you very natural results, which helps to add subtle definition to your peepers without looking too dramatic. Eyeliner Embroidery helps to achieve more refined, refresh eye effect and giving you the image of ‘bigger’ eyes. Say Goodbye to your eyeliner and mascara! Try our K-Natural Eyeliner Embroidery services today! Free Consultation. Comes with 1 free touch up. Imported ingredients. Korean Consultant and Specialists. This is one lipstick that definitely wont transfer. KO BROWS’ lips embroidery service uses natural imported pigments that are FDA approved and comes in a palette of very flattering My Lips But Better (MLBB) colours for Asian customers. Helps to achieve a healthy natural lip color of your preference without having to put on lipstick! Full Tint Lips, Beauty Spot Services Available. What are you waiting for? K-Natural Lips Embroidery services comes with 1 free touch up. Free Consultation. Imported ingredients. Korean Consultant and Specialists. Did you know that pulling your hair into a tight bun or ponytail regularly can lead to a receding hairline? 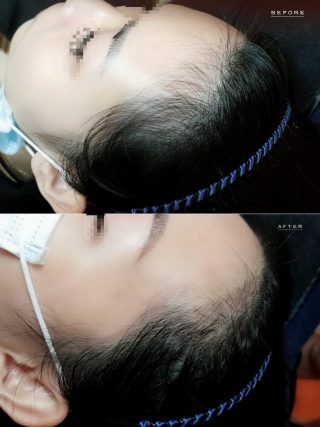 If this information came too late, don’t despair, because with K-Natural Hairline Embroidery, you can fill your irregular hairline so that you can have your crown of glory back. KO BROWS K-Natural Hairline Embroidery services also helps to realign irregular shapes and naturally fills the empty spaces to create a more youthful look! M-Hairline, Volume Hairline, Scar Cover Tattoo available! Comes with 1 free touch up. Free Consultation. Imported ingredients. Korean Consultant and Specialists. Our latest K- Style of Korean Skincare services by KO BROWS. Click below and check out our comprehensive range of services!! Provides different skincare needs and objectives for individuals such as whitening, hydration, acne treatment, anti-aging, improve fine lines and wrinkles.revitalize dull skin and lightening of pigmentation. Skin analysis and consultation will be provided. *Enjoy a Complimentary Skin Analysis Service with every Skincare Treatment Service! It is due to the oxidation of the color pigment. Your eyebrows will look lighter from the first session as your skin heals over the pigment after 3 to 5 days. About after 3 to 7 days.